Tuck’s first aerial combat took place over Dunkirk on 23 May 1940, as a flight commander in 92(F) Squadron when he destroyed three German fighters.The following day he shot down two German bombers and as aerial fighting intensified over the next two weeks his score rapidly mounted. 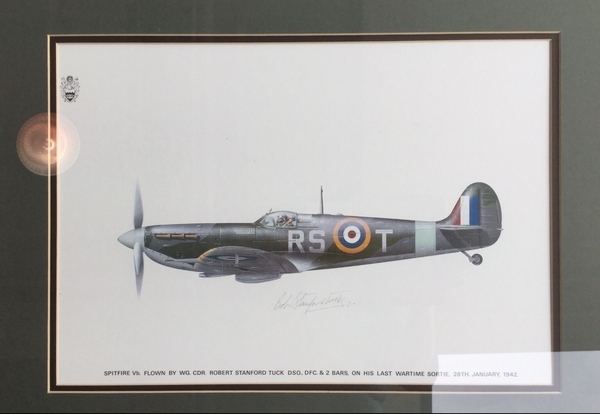 He continued to serve with No 92 Squadron on Spitfires, commanding one of the Flights throughout the Dunkirk battles, the large air battles over the Channel in the build-up to the Battle of Britain. On 28 June Tuck was awarded the Distinguished Flying Cross (DFC) by King George VI for his initiative and personal example over Dunkirk. Tuck continued to command No 257 squadron until half way through 1941, when he was given command of the Fighter Wing at Duxford. In October 1941 he lectured in the USA on air combat and flew all the American fighters as part of an Air Ministry assessment for the Lend-Lease programme.When he returned to the UK he took command of the Biggin Hill wing of four Spitfire Squadrons. His air combat career finished credited with 29 air victories when he was shot down by ground fire during a low level attack over Northern France in January 1942 and was taken prisoner by the Germans. He spent the next three years as a POW, managing to escape in January 1945. Back in England by April 1945, he completed a refresher course on Harvards at Digby before flying Vampires and Meteors at Tangmere and West Raynham. In 1946 Tuck became Station Commander at Coltishall, and after a spell in Singapore, retired from the RAF in 1949. In 1978, the Aircraft Recovery Group excavated the remains of an Me 109 22ft deep in the marshes, (sadly still containing the remains of the pilot, Lt.Wemer Knittle), and after considerable research at the MOD, it was decided that it was an aircraft Tuck had shot down, but had only claimed as “probable” at the time. It was duly accredited to him, bringing his total victories to 30.